How to reach Derawan Island? The nearest airport is Berau (= Tanjung Redeb) and 2nd nearest airport is Tarakan. 3) In this way you fly the same day from Balikpapan – Berau with Kalstar, Trigana, Sriwijaya, Lion air, Garuda to (40min-1hr, ±600.000 IDR). *1 hour time difference between Balikpapan (BPP) and Jakarta (JKT). 1 of the 2 daily flights of Kalstar & Trigana transfer in Samarinda. See alternative travel routes (colors) in the picture below. The trip back could be much shorter because you do not have to stay overnight in Jakarta if you book a flight that departs to NL in the evening. 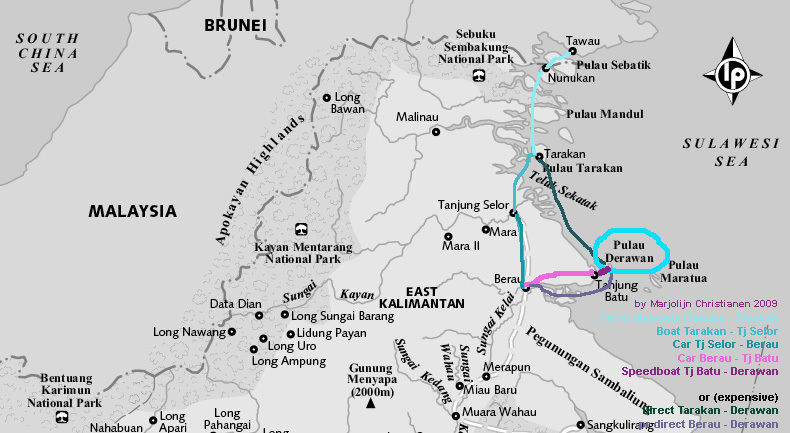 WIj gaan over 6 wkn richting Derawan. We zijn druk bezig met het uitzoeken hoe we daar het beste kunnen komen. We zitten in Palangkaraya en vliegen 4 mei naar Berau. Ik kwam op jou pagina terecht omdat ik op zoek was naar de beste verbinding naar Derawan. Heb je nog tips voor op het eiland? I planned to hire Narton to organise my logistic for two to Derawan Island on this coming 25th Sept. 2013, he has quoted me IDR800K for car to Tj. Batu, 600K for speed boat to Derawan, 750K for 3 nights stay, do you think the offer is reasonable, hope to receive your reply before my flight over there on 25th (late plan due to unforeseen circumstances). Prices are changing fast because of increased petrol prices, and quoted on this website were last checked in 2011. Nevertheless the prices seem too high and you need to negotiate. Good luck. Just refer to that you know the prices. Wondering if you want to spend another weekend at Derawan Island. I plan to go there on Nov 28 – Dec1. Is the weather ok these days? Las questions, do you have the contact number of Mirroliz Pelangi? Weather is normally fine around this time. I don’t have the number you are asking for. Weet jij of ik inTawau een visum voor kalimantan kan regelen. Kan hier weinig over vinden op internet.